With the codification of the Axioms came the means to address key points on a case that could unravel all aberration. Basic Postulates, Prime Thought, Cause and Effect and their effect on everything from memory and responsibility to an individual’s own role in empowering engrams—these matters are only addressed in this series. Here, too, is the most complete description of the Service Facsimile found anywhere—and why its resolution removes and individual’s self-imposed disabilities. In the fall of 1951, the world was riveted by a new war in Korea. Both the United States and China had entered the fray and conflict threatened to spiral out of control. American headlines urged national readiness for an impending Russian attack. Man was at peril of forces beyond his control. Yet quite another kind of explosion was about to occur—one that would radically change this perennial view of ‘Man, the victim.” Its epicenter was Wichita, Kansas, and specifically, 211 Douglas Street, the busy hub of a growing and vital Dianetics movement. Students came from all corners of the United States to learn auditing and attend L. Ron Hubbard’s much-anticipated weekly lectures. Revealed therein were the results of his ongoing research, which, in the 17 months since publication of Dianetics, had unlocked even more secrets of the human mind. In October, codifying this knowledge into the Logics and Axioms, Ron unveiled them to a specially convened conference of auditors. Through a series of ten lectures, The Logics and Axioms, he not only clarified all preceding discoveries, but set a bold new direction for what was to come. For among Mr. Hubbard’s breakthroughs, one factor shone forth above all others: SELF-DETERMINISM. Thus, Man was not a leaf blown about by the winds of chance. The hard, cold fact emerging from the Axioms was that a being became aberrated only through his own consent. So came a whole new dimension to the handling of cases. 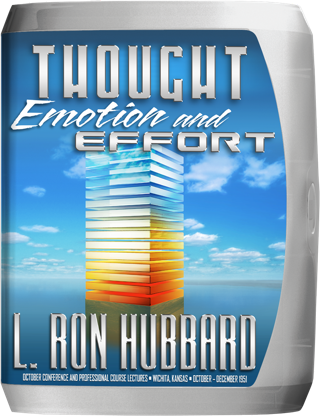 While the stimulus-response mechanisms of EFFORT had been explored in Dianetics, and the complexities of EMOTION charted in Science of Survival, one factor was found to underlie both and hold aberration in place: THOUGHT. To address all three points, THOUGHT, EMOTION and EFFORT, Mr. Hubbard developed the “Fifteen Acts” of Advanced Procedure and, in November, published his complete findings in a new book, Advanced Procedure and Axioms. Next, he announced a Professional Course to be held later that month where he would instruct on application of all contained in the text. Applicants were told to present themselves in person at the Wichita Foundation—and did so in force. So commenced the Professional Course and the eleven lectures comprising the Thought, Emotion and Effort series. 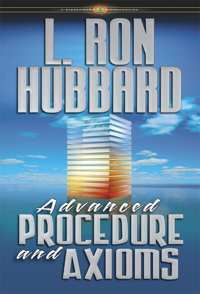 Paramount amongst the breakthroughs L. Ron Hubbard revealed is the original and most complete definition and description of the SERVICE FACSIMILE, detailing the mechanisms by which a being postulates his own illnesses and disabilities. Here, then, was the how and why of this dramatization and all that lay behind it—from POSTULATES and PRIME THOUGHT to the anatomy of FAITH and the route to FULL RESPONSIBILITY. 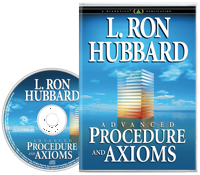 In short, here is the complete evolution from the codification of the Logics and Axioms (the lectures, The Logics and Axioms),to the techniques of Advanced Procedure employing the breakthroughs of those axioms (the book, Advanced Procedure and Axioms), to the Professional Course instructing on their full use and application (the lectures of Thought, Emotion and Effort). Here, then, are the breakthroughs which formed the turning point form Dianetics to Scientology and from EFFECT to CAUSE.